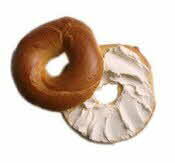 Bagels are the only bread product that is boiled before it is baked. Bagels are formed from an eggless dough (flour, yeast, water and oil) into a donut shape, then droped in rapidly boiling water, cooked 3 - 5 minutes on one side then flipped and cooked 3 -5 minutes more on the other side. Drained, sometimes brushed with egg and then baked for 10 minutes or so. "the first printed mention of bagels...is to be found in the Community Regulations of Kracow, Poland, for the year 1610 – which stated that bagels would be given as a gift to any woman in childbirth." The derivation of the word bagel is also unclear. Joan Nathan, the author of "Jewish Cooking in America" (Knopf, 1998), says it comes from the German verb "biegen," "to bend." The late Alan Davidson wrote in his ‘Oxford Companion to Food’ that the word arose from the Yiddish "beygel," itself taken from the German "beugel," meaning ring or bracelet. When Austria Jews emigrated to America, they brought the beugel with them. The first beugel bakeries were founded in New York City in the 1920s. Later the name was Americanized and called a bagel. Bagels have been used to symbolize the continuous cycle of life—without beginning and without end. Prepackaged bagels first became available in grocery stores in the 1950’s. Frozen bagels were introduced in 1960.